Image courtesty of Armadillo Ale Works. After more than four years of being one of the few North Texas brewing operations to eschew the IPA, Armadillo Ale Works of Denton has altered course to produce a version of craft beer's most popular style. 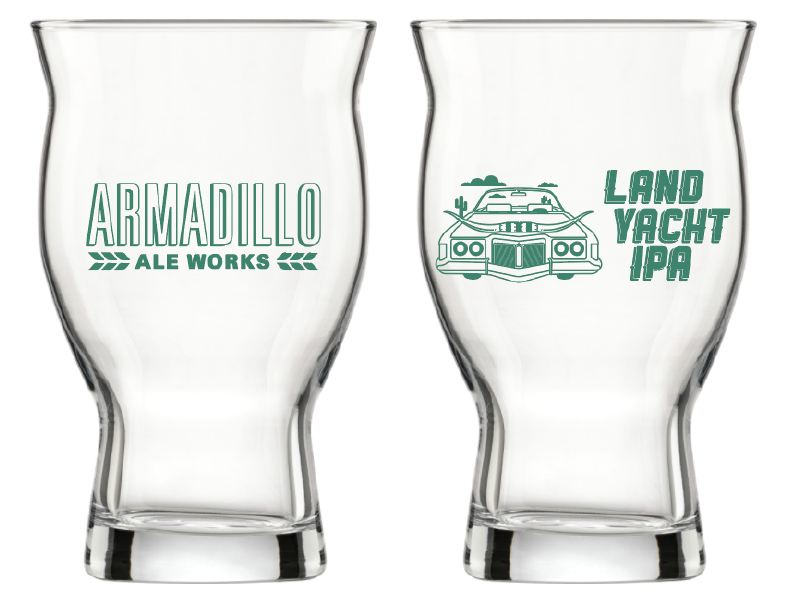 Land Yacht IPA (7.3% ABV, 75 IBU) is set to embark on an introductory tour of the Metroplex, after which it will join Armadillo's core lineup alongside Honey Please, Royal Champ and Greenbelt Farmhouse Wheat. The beer is an American IPA that's been brewed to style, featuring a copious amount of Azacca, Mosaic, Citra, Columbus, and Centennial hops. But why, you may ask, would a company that's known for its uniqueness decide to release a stylistic IPA at this point in its evolution? According to co-founder Yianni Arestis, it's all about doing the unexpected, which up to now has been a hallmark of Armadillo's approach. "Normally, we cross style boundaries and use special ingredients in our beers to offer the consumer something tasty, interesting and truly different," says Arestis. "After coming out with seven beers like that, though, we felt it would be cool to show people we can brew to style with the best of them." 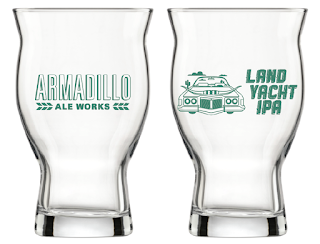 Special Land Yacht IPA glassware will be available at launch events occurring this weekend (Armadillo Ale Works). Along those lines, you won't find any additives in Land Yacht IPA. With so many different takes on the IPA in the market these days, many falling in line with the current trend of adding fruit infusions, Arestis and co-founder Bobby Mullins chose to go against the grain in sticking to style. 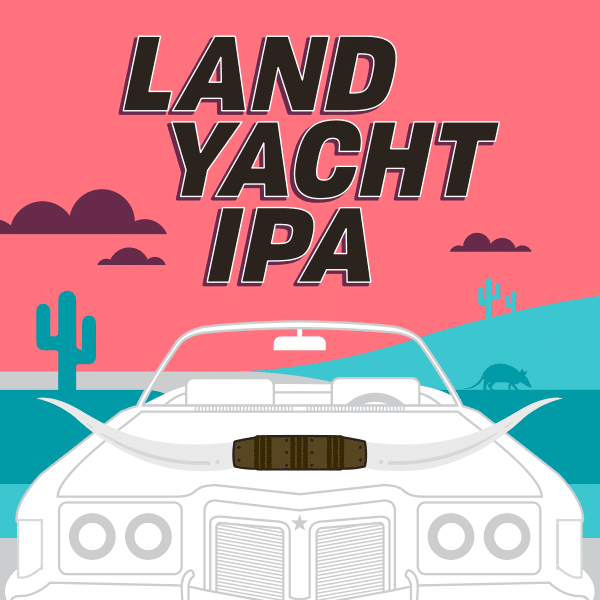 Accordingly, their first IPA foray is all about the hops, a characteristic that's been subtly built into the Land Yacht name. "We wanted a name that hinted at the beer using 'a boatload of hops,' as well as something that alluded to going on a 'tropical flavor trip,'" says Arestis. "Since it's an American IPA, we figured a big, classic American car, a land yacht if you will, would make sense. Plus, the longhorns on the hood are an obvious tie-in to our Texas roots." As for how it turned out, an early sample of Land Yacht IPA shows it to be a beer that gives off notes of sharp citrus and pine initially, with a ripe pineapple and tropical fruit character developing as it opens up. It's a little dank and a little musky with not a lot of bitterness, the latter meaning more emphasis was put on highlighting hop flavor and aroma. The beer is neither east coast or west in terms of a regional designation, but rather something that falls somewhere in the middle. Given that, instead of trying to pin it down, maybe just call Land Yacht IPA what it is...a really good, easy-drinking Armadillo-style IPA. Land Yacht IPA will be available as a draft-only offering. Look for it on tap beginning this weekend at launch parties planned at the following locations. East Side, Denton: 7-10 p.m.
Lakewood Growler, Dallas: 4-7 p.m. Brewed, Fort Worth: 6-9 p.m. Taking another step in its brand revival, Celis Brewery of Austin has signed with Andrews Distributing Co. for the delivery of its products to the North Texas market. Celis Brewery originally arrived on the Texas scene in 1992, being founded by renowned Belgian brewer Pierre Celis. His daughter Christine now carries the mantle of the family name with her new venture, which will operate out of a 22,000 square-foot facility in Northwest Austin. There, Christine's team will brew Pierre’s famous Belgian-style recipes, including the award-winning witbier, Celis White. Christine Celis, founder and CEO of Celis Brewery, says she is excited to watch the re-introduction of Celis’ beers in North Texas. Kelli Hopson, Andrews craft brand manager, says the Andrews team looks forward to being a part of Celis’ growth and success in Texas. According to a press release, Andrews plans to launch Celis in North Texas the week of July 3. The initial rollout will include Celis White on draft, with beers like Pale Bock and Citrus Grandis IPA slated to arrive on draft in August. After that, consumers should expect to see all three beers in bottles come September. For more information on Celis and the brewery's upcoming events, visit www.facebook.com/CelisBeers. Partnering once again with Noble Coyote Coffee Roasters for its annual release, French Quarter Temptress from Lakewood Brewing Co. of Garland is now available. On the market for the first time in four-packs of 12-ounce bottles, French Quarter Temptress is a beer that's said to capture the spirit and attitude of New Orleans. It's brewed with chicory and barrel-aged coffee beans, the latter having been aged in freshly-emptied bourbon barrels for months. 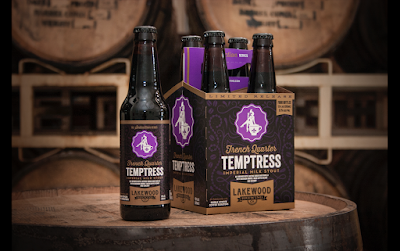 Deliveries of French Quarter Temptress began this week in the Dallas-Fort Worth area. Shipments to other Texas markets are slated to occur in the coming weeks. Image credit: National Fantasy Football Convention. Looking to introduce its products to a wider audience, Texas Ale Project has announced a new tie-in which will see its brand recognized as the official beer of the 2017 National Fantasy Football Convention (NFFC). The NFFC, for those that aren't aware, is a collaborative venture founded by a group that includes former Dallas Cowboys quarterback, Tony Romo. It was originally slated to debut in 2015, but legal wranglings led to its cancellation the past two years. Now set to occur at Fair Park in Dallas from July 14-16, the three-day event will feature exhibits, performances and parties, where fans can interact with more than 50 current and former NFL players. "We're truly excited about our new partnership with the NFFC. This is a unique opportunity to grow our brand and bring football fans and quality craft beer closer together," says Kat Thompson, CEO and co-founder of Texas Ale Project. "We appreciate the NFFC's support of local businesses like ours." As part of the festivities, Texas Ale Project will host the NFFC After Party at its location in the Dallas Design District on Saturday, July 15. Admission to the after party is included in the price of a convention ticket, which can be obtained by visiting GoNFFC.com. In addition, take note that attendees may use code TAP17 to receive $20 off the regular ticket price. 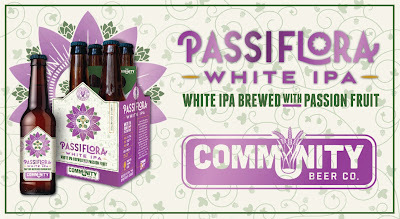 Being billed as a new, refreshing summer offering, Community Beer Co. of Dallas is set to release Passiflora White IPA. Named for the passion fruit flower, Passiflora follows the style of a white IPA in that it's cross between an American IPA and a Belgian witbier. In this case, though, Community has put it's on spin on the style by adding a generous amount of passion fruit puree to a beer that's brewed with a blend of Mosaic and Citra hops. "We're big fans of hoppy beers here at the brewery, and we wanted to brew something that pairs perfectly with summertime weather," says Jamie Fulton, brewmaster at Community. "Passion fruit is a slightly tart, tropical fruit which compliments the flavors and aromas of the hop blend. The signature spicy Belgian yeast ties the whole beer together, resulting in a very drinkable, hop-forward IPA that craft beer fans are sure to enjoy!" Look for Passiflora White IPA to be available during the summer months, both on draft and in four-packs of 12-ounce bottles. An official launch party for the beer will be held at Community's taproom in the Dallas Design District on Thursday, June 29 at 5 p.m. Earlier this month, Shannon Brewing Co. of Keller let it be known a new beer was in the works in the form of Shannon Super Saison. What wasn't immediately revealed, however, is the fact that this imperial Belgian-style saison was brewed with a new yeast strain. Shannon and another company in Milwaukee, WI, are the first two commercial breweries in North and South America to ferment beer with Fermentis SafAle BE-134. According to Kevin Lane, technical sales manager for Fermentis, the strain is ideal for use in saisons. In addition to lending fruit and spice elements to a beer, SafAle BE-134 is characterized by a particular high attenuation. The attenuation factor surely played a role in selecting the yeast for use in Shannon Super Saison, which is notable for its added strength. "Fermentis has been a great partner and we are very proud to be the first brewery in the U.S. to brew with this yeast," says founder Shannon Carter. "Our Super Saison was a true challenge for this yeast. 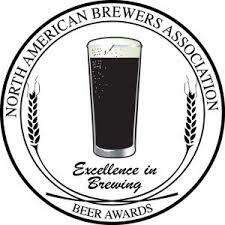 The beer had an original gravity (OG) of 18.7 and a final gravity (FG) of 1.2, giving the beer an ABV of 9.5%. The aroma is beautiful, with hints of citrus and some clove, while the taste is effervescent and refreshing with a slight alcohol kick in the finish." Lane would appear to agree with Carter's assessment, based on his impression of how the beer turned out. "I've tasted the beer that Shannon is working on and I am very excited about the finished product," adds Lane. "I will be there when it launches for sure." Look for Shannon Super Saison to be available for a limited time on draft and in cans. The beer will debut in the brewery's taproom on Friday, June 9, prior to being tapped for Shannon's upcoming Dad Fest event, occurring on Saturday, June 10. Labels: Belgian beers, Keller, limited release, press release, saison, Shannon Brewing Co.